Recent regulations on heavy metal testing have required the pharmaceutical industry to monitor a suite of elemental impurities in pharmaceutical raw materials, drug products, and dietary supplements. These directives are described in the new USP Chapters <232>, <2232>, and <233>,1 together with ICH Q3D, Step 4 guideline,2 which suggests the use of plasma spectrochemistry to measure 24 elemental PDE (permitted daily exposure) levels in the various drug delivery categories. This article describes the basic principles of inductively coupled plasma mass spectrometry (ICP-MS), which is one of the recommended techniques for carrying out the elemental determinations. It walks a novice through the various instrumental components, to get a better understanding of its practical capabilities. Inductively coupled plasma mass spectrometry (ICP-MS) is undoubtedly the fastest growing trace element technique available today. Since its commercialization in 1983, approximately 16,000 systems have been installed worldwide for many varied and diverse applications. The most common ones, which represent approximately 80 percent of the ICP-MS analysis being carried out today include environmental, geological, semiconductor, biomedical and nuclear market segments.3 However, over the past few years, with new heavy metal regulations being implemented, pharmaceutical applications are rapidly catching them up. There is no question that the major reason for its unparalleled growth is its ability to carry out rapid multielement determinations at the ultratrace level. Even though it can broadly determine the same suite of elements as other atomic spectroscopic techniques, such as flame atomic absorption (FAA), electrothermal atomization (ETA), and inductively coupled plasma optical emission (ICP-OES), ICP-MS has clear advantages in its multielement characteristics, speed of analysis, detection limits, and isotopic capability.4 Figure 1 shows approximate detection limits of all the elements that can be detected by ICP-MS, together with their isotopic abundance. There are a number of different ICP-MS designs available today that share many similar components, such as nebulizer, spray chamber, plasma torch, interface cones, vacuum chamber, ion optics, mass analyzer, and detector. However, the engineering design and implementation of these components can vary significantly from one instrument to another. So let us begin by giving an overview of the principles of operation of ICP-MS. 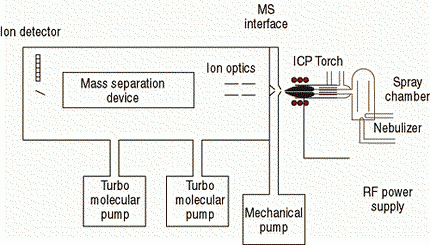 Figure 2 shows the basic components that make up an ICP-MS system. The sample, which is typically in a liquid form, is pumped at 1 mL/min, usually with a peristaltic pump into a nebulizer, where it is converted into a fine aerosol with argon gas at about 1 L/min. The fine droplets of the aerosol, which represent only 1 to 2 percent of the sample, are separated from larger droplets by means of a spray chamber. The fine aerosol then emerges from the exit tube of the spray chamber and is transported into the plasma torch via a sample injector. It is important to differentiate between the roles of the plasma torch in ICP-MS compared to ICP-OES. The plasma is formed in exactly the same way, by the interaction of an intense magnetic field (produced by radio frequency [RF] passing through a copper coil) on a tangential flow of gas (normally argon), at about 15 L/min flowing through a concentric quartz tube (torch). This has the effect of ionizing the gas, which when seeded with a source of electrons from a high-voltage spark, forms a very-high-temperature plasma discharge (~10,000 K) at the open end of the tube. However, this is where the similarity ends. In ICP-OES, the plasma, which is normally vertical (but can be horizontal with dual-view designs), is used to generate photons (light energy) by the excitation of electrons of a ground-state atom to a higher energy level. When the electrons “fall” back to ground state, wavelength-specific photons are emitted that are characteristic of the element of interest. In ICP-MS, the plasma torch, which is positioned horizontally, is used to generate positively charged ions and not photons. In fact, every attempt is made to stop the photons from reaching the detector because they have the potential to increase signal noise. It is the production and detection of large quantities of these ions that gives ICP-MS its characteristic low-ppt (parts per trillion) detection capability—about three to four orders of magnitude lower than ICP-OES. Once the ions are produced in the plasma, they are directed into the mass spectrometer via the interface region, which is maintained at a vacuum of 1 to 2 torr with a mechanical roughing pump. This interface region consists of two or three metallic cones (depending on the design), called the sampler and a skimmer cone, each with a small orifice (0.6 to 1.2 mm) to allow the ions to pass through to the ion optics, where they are guided into the mass separation device. The interface region is one of the most critical areas of an ICP mass spectrometer, because the ions must be transported efficiently and with electrical integrity from the plasma, which is at atmospheric pressure (760 torr), to the mass spectrometer analyzer region, which is at approximately 10−6 torr. Unfortunately, there is the likelihood of capacitive coupling between the RF coil and the plasma, producing a potential difference of a few hundred volts. If this is not eliminated, an electrical discharge (called a secondary discharge or pinch effect) between the plasma and the sampler cone would occur. This discharge would increase the formation of interfering species and also dramatically affect the kinetic energy of the ions entering the mass spectrometer, making optimization of the ion optics very erratic and unpredictable. For this reason, it is absolutely critical that the secondary charge be eliminated by grounding the RF coil. There have been a number of different approaches used over the years to achieve this, including a grounding strap between the coil and the interface, balancing the oscillator inside the RF generator circuitry, a grounded shield or plate between the coil and the plasma torch, or the use of a double interlaced coil where RF fields go in opposing directions. They all work differently but basically achieve a similar result, which is to reduce or eliminate the secondary discharge. Are you in compliance with the new elemental impurities standards? Once the ions have been successfully extracted from the interface region, they are directed into the main vacuum chamber by a series of electrostatic lenses, called ion optics. The operating vacuum in this region is maintained at about 10−3 torr with a turbomolecular pump. There are many different designs of the ion optic region, but they serve the same function, which is to electrostatically focus the ion beam toward the mass separation device, while stopping photons, particulates, and neutral species from reaching the detector. The ion beam containing all the analyte and matrix ions exits the ion optics and now passes into the heart of the mass spectrometer—the mass separation device, which is kept at an operating vacuum of approximately 10–6 torr with a second turbomolecular pump. There are many different mass separation devices, all with their strengths and weaknesses. Three of the most common types — quadrupole, magnetic sector, and time-of-flight technology — basically serve the same purpose, which is to allow analyte ions of a particular mass-to-charge ratio through to the detector and to filter out (reject) all the non-analyte, interfering, and matrix ions. Depending on the design of the mass spectrometer, this is either a scanning process where the ions arrive at the detector in a sequential manner, or a simultaneous process where the ions are either sampled or detected at the same time. Most quadrupole instruments nowadays are also sold with collision/reaction cells or interfaces. This technology offers a novel way of minimizing polyatomic spectral interferences by bleeding a gas into the cell or interface and using ion–molecule collision and reaction mechanisms to reduce the impact of the ionic interference. The final process is to convert the ions into an electrical signal with an ion detector. The most common design used today is called a discrete dynode detector, which contains a series of metal dynodes along the length of the detector. In this design, when the ions emerge from the mass filter, they impinge on the first dynode and are converted into electrons. As the electrons are attracted to the next dynode, electron multiplication takes place, which results in a very high stream of electrons emerging from the final dynode. This electronic signal is then processed by the data-handling system in the conventional way and converted into analyte concentration using ICP-MS calibration standards. Most detection systems can handle up to nine orders of dynamic range, which means they can be used to analyze samples from low/sub ppt levels up to a few hundred ppm, depending on the analyte mass. 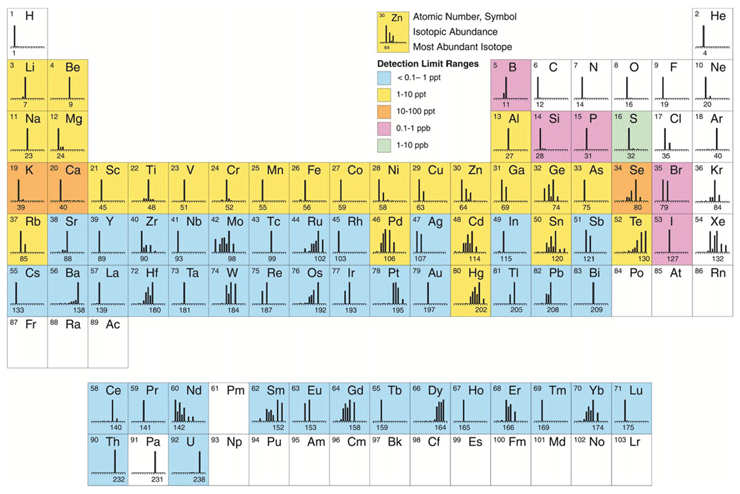 It is important to understand that there are many factors to consider when selecting a trace element technique most suited to the demands of your application. Sometimes, one technique stands out as being the clear choice, whereas other times, it is not quite so obvious. And as is true with many applications, more than one technique is often suitable. However, the current methodology described in the new USP Chapters <232> and <233> presents unique challenges, not only from a perspective of performance capability, but also because of the validation protocols that have to be met in order to show suitability of the technique to the analytical procedure being used. From a practical standpoint, there is no question that to meet all the PDE limits in all pharmaceutical delivery methods, particularly for parenteral and inhalation drugs where the PDEs are significantly lower, ICP-MS is clearly the most appropriate technique. This article is intended to help new users to the technique better understand the basic principles. For more detailed information about using ICP-MS for measuring heavy metals in pharmaceuticals, please refer to the book Measuring Elemental Impurities in Pharmaceuticals: A Practical Guide,5 on which this article was based. International Conference on Harmonization of Technical Requirements for Registration of Pharmaceuticals for Human Use http://www.ich.org/products/guidelines/quality/article/quality-guidelines.html. Robert J. Thomas has worked in the field of trace element analysis for over 40 years, including 23 years for an atomic spectroscopy instrumentation manufacturer and 17 years as a principal of his own consulting company. He has authored over 80 publications on trace element analysis including four textbooks on ICP-MS. His latest book is entitled Measuring Elemental Impurities in Pharmaceuticals: A Practical Guide. He is currently editor and frequent contributor to the Atomic Perspectives column in Spectroscopy magazine. He has an advanced degree in analytical chemistry from the University of Wales in the UK, and is a Fellow of the Royal Society of Chemistry (FRSC) and a Chartered Chemist (CChem).